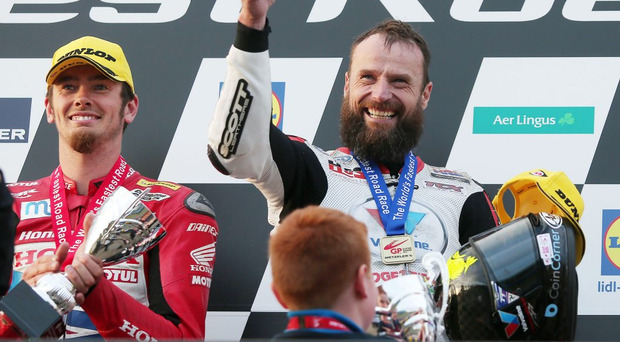 A high-speed Superbike duel between the world’s fastest road racer Bruce Anstey and 14-times Dundrod winner Guy Martin ended dramatically last night when the latter high-sided out of the action at Irelands Corner on the sixth and final lap, an accident that brought out the red flags. Fortunately, the 33-year-old Tyco BMW rider was not seriously injured, although he was taken to the Royal Victoria Hospital with suspected broken ribs and subsequently ruled out of the race. The result of the race went back to lap five and although Martin was leading at the time, he was excluded from the results, handing victory to Anstey, riding the Valvoline Padgetts Honda. The New Zealander, taking his 12th Dundrod victory, explained: “Guy was flying and I was in a really good dice with him. “As it was the last lap I was going to have a go at him at Tornagrough or the Hairpin, but as he got on the throttle out of Irelands he just high-sided in front of me. Second place was credited to Manxman Conor Cummins, also Honda mounted, who had an abysmal start and fought through from sixth position at the end of the opening lap to finish 4.779seconds behind Anstey. Third position went to last year’s best newcomer Peter Hickman, who rode a blinding race with a fastest lap of 132.413mph on lap four and finished just over half a second behind Cummins. Lee Johnston, Ian Hutchinson (with gear linkage problems) and Michael Dunlop all retired from the red-hot action. Hutchinson and Johnston bowed out at the end of lap three when in the leading group, while Dunlop followed a lap later having improved from 11th on lap one to fifth. Results: Dundrod 150: 1st B. Anstey avg. speed 131.196mph, 2nd C. Cummins 130.425, 3rd P. Hickman 130.332, 4th D. Kneen 129.258, 5th K. Amor 129.054, 6th W. Dunlop 128.995.